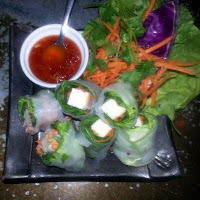 As I was writing about Carbondale and Phat Thai I began to crave "FRESH SPRING ROLLS with TOFU mint & cellophane noodles herbs | sweet chili sauce". If I were still in Carbondale, I know where I'd go for dinner. However, since I'm ~2,200 miles away, I decided to try to make them myself. Having just a vague idea about the wrapping and no idea what "cellophane noodles" are, I looked to Google search for help. For buying rice paper (and even learning how rice paper is made) and detailed instructions and options for wrapping spring rolls, I found Viet World Kitchen very useful. After just two tries, this is still a work in progress. The bad news is as a beginner it is not easy to get perfect looking rolls every time. The good news is, as Viet World Kitchen points out, "If you mess up, remember that rice paper is forgiving. Plus, an 8- or 12-ounce package contains plenty of papers for you to practice with in your initial forays. Boo-boos are yours to eat!" As you can see from my photos, I'm still in the "boo-boo" phase; however, though the rolls may not look perfect, they are still very tasty. I got all the necessary Asian ingredients at Whole Foods: Galettes de Riz Spring Roll Skin (6 " diameter, Vietnam), China Bowl Cellophane Noodles (Taiwan) and Mae Ploy Sweet Chili Sauce (Thailand). Not much of a choice so I took what was available and hoped Whole Foods had done some vetting. Next time I am in an Asian market I plan to try to find some Three Ladies brand rice paper (bánh tráng). Remove the 16 oz block of tofu from the container, cut in half lengthwise and return 8 oz to the container and reserve for future use. Place the 8 oz piece on dishtowel, cover and place weight (I use a brick covered with aluminum foil, heavy cans work too) on top to squeeze out excess moisture. Let sit ~30 minutes. Turn off the heat and let the noodles sit for 10 minutes. While noodles are soaking prepare the herbs. Phat Thai's spring rolls are strong on mint and also contain other "herbs". While I mostly remember the mint I think the other herbs included cilantro and Thai basil. Since Ed is not a big mint fan, I use less mint and more of the other herbs. Adjust quantities of each according to availability and personal taste. REVISED 30 APRIL 2012 - The first two times I made these rolls, I coarsely chopped the herbs (herbs left, photos of rolls above), subsequently I have left the leaves mostly whole, as I recall Phat Thai does. The first time, I did not roll the rolls tightly enough; they looked okay but they were impossible to eat as they fell apart after the first bite. I have found rolls made with the whole leaves and rolled tightly hold together very well, and also I think their appearance is superior to those made with chopped herbs. Be sure that all stems are removed from the herbs as they will puncture the thin skin of the rice paper. I learned this lesson the hard way. Tear very large leaves in half, leave most or all whole. Divide evenly into 10 "portions" weighing ~0.2 oz (~6 grams) each. When it is well drained cut the tofu into 10 equal pieces perpendicular to the longest dimension. When the noodles have soaked for 10 minutes, drain. on one side then on the other. Shake off excess water and place the rice paper on a plate or cutting board. Let rice paper sit for 30 - 60 seconds until it is pliable and transparent. I work with two pieces of paper at a time. Place a few noodles, ~ 1/2 one "portion" of the herbs, a tofu strip, a few more noodles, and then the remaining herbs in the "portion" on the bottom half of the rice paper circle, far enough down so that when the bottom lip is rolled over the filling, half of the circle remains. The long length of the leaves should parallel the rolling axis. It looks like a lot of filling, but if you press the leaves down when rolling they will really condense. After rolling the bottom up over the top, fold in each side (photo at left) Then continue rolling until all the rice paper is wrapped around the filling. Be sure to roll very tightly, compressing the leaves as much as possible. For excellent photos of this process see Viet World Kitchen. Not yet having my own recipe for dipping, I used the Mae Ploy Sweet Chili Sauce which is similar to the sauce made at Phat Thai. * March 2013 Update: Ed and I just got back from Colorado and two visits to Phat Thai. Green Chicken Curry is as good as ever. Spring Rolls (photo left) good too but a bit different than I remembered. Piece of tofu is comparatively large and is wrapped in a few small tender leaves of Boston/Butter lettuce along with a bit of basil, cilantro and mint and some shredded carrots. No cellophane noodles noticable. Since then I've made with lettuce instead of noodles, tasty and a step easier. ** January 2014: Super-firm tofu, a relatively new product, does not require pressing and can be used directly out of the package.